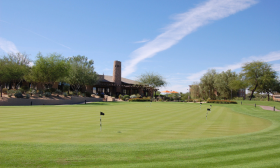 Dreaming about owning a home on one of our championship courses in AZ? You've come to the right place to start your home search. 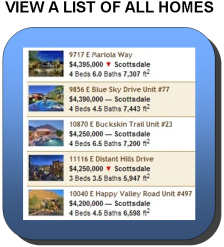 From this page you can easily browse all available Scottsdale golf course homes for sale from the Arizona MLS. We update our listings daily, so you can be confident you are viewing the most accurate and up-to-date information available. 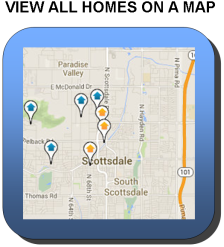 To begin, simply click on one of the buttons below to view all listings, or view homes by location on a map. If you decide to purchase a home with golf course views, there's a chance, a really good one, that your home is going to be struck by golf balls on occasion. This has seemed to be of particular concern to those with children who will be playing or swimming in the back yard. Over the years, we've learned a lot of little tricks to help minimize the risk. When shopping for your home, either grab a scorecard from the clubhouse, or view an aerial map of the home. Look at where the home sits in relation to the fairway and hole. When a golfer goes to drive the ball, is the house in perfect slice distance from the tee box? Is the house right next to the green? If so, the house may be at higher risk for being struck by a golf ball. When viewing a golf course home, wander out to the garage. If the homeowner has boxes full of used golf balls, you need to ask yourself, "where did these balls come from?" Chances are, these are balls that landed in the sellers back or side yard. Take a walk around the home and look at the stucco exterior. Are there a couple of places where a golf ball struck the stucco, or are there hundreds? Even if the homeowner has had the damage fixed, seldom is the repair job perfect, and there will be signs of the previous damage. If the house has been vacant for a while, just take a walk around the yard and look for golf balls. I showed a foreclosure a few years ago that had been vacant for an extended period of time. There were literally hundreds of golf balls at the bottom of the pool. If a home ends up being in "the line of fire" so to speak and you still want to buy, there's companies which will install golf nets which can effectively shield the home from ball strikes. Do verify with the homeowners association to make sure they are permitted. None of this is intended to scare you, it's more to raise your awarness on how to spot a home that potentially may have an issue. Owning golf real estate is typically a very enjoyable experience and highly sought after by buyers in our market.